Cruise Critic®, the world’s leading cruise reviews site and online cruise community, has announced the winners of its first-ever Cruisers’ Choice Destination Awards, naming the top cruise destinations in the world, based on consumer ratings submitted with reviews on the Cruise Critic website. The awards name award-winning destinations across 15 regions, worldwide. Grand Turk was named the second best cruise destination in the Eastern Caribbean, Bahamas & Bermuda cruise port region, with cruisers particularly enamored with the island’s beautiful beaches, great shopping, and friendly locals. According to a recent survey by Cruise Critic, selecting a cruise destination is the most important part of the planning process for both first-time cruisers (28%) and experienced cruisers (29%). St. Maarten was the top-rated Eastern Caribbean Island, with St. Thomas, St. Kitts and King’s Wharf in Bermuda ranking third, fourth, and fifth behind Grand Turk, respectively. Bonaire was named the highest-rated Southern Caribbean Island, and Cozumel the top destination in the Western Caribbean & Riviera Maya. Castaway Cay – owned by Disney Cruise Line – ranked highest among cruise line private islands, and topped all Caribbean categories combined. Cruisers praised the island’s clean, beautiful beaches and multitude of options for both kids and adults. River cruise port cities were the top-rated category as a whole, with all of the top five destinations receiving the highest marks across the board. Paris was rated the best river cruise destination, with reviewers naming the city’s beauty, museums and gardens as particularly impressive. As for the best cruise destination in North America, San Francisco was named to the top of the list in the U.S. & Canada category. 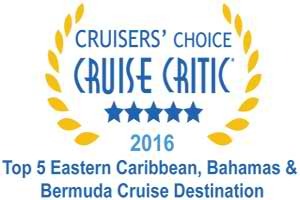 For the full list of winners, visit the 2016 Cruise Critic Cruisers’ Choice Destination Awards. Cruise Critic boasts the world’s largest online cruise community, with more than 160,000 cruise reviews, covering approximately 500 cruise ships and over 300 worldwide ports. Awards are based on reviews submitted for cruises taken over the past year.